New for December 2008! The Lim Eom six-port network has some unique properties. 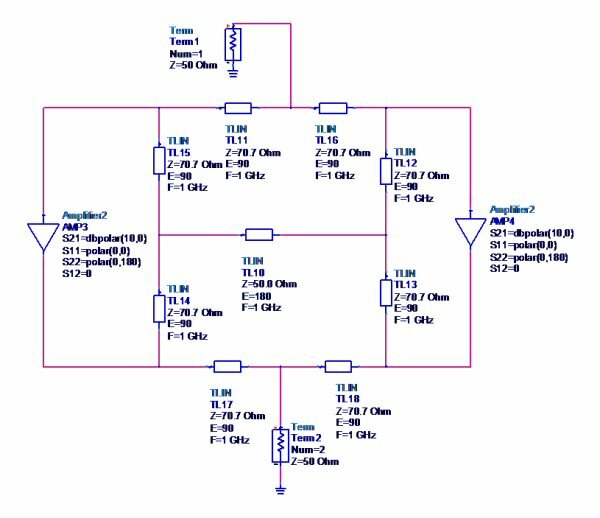 Recently it was used by the original author Jong-Sik Lim and his team to power-combine a pair of amplifiers as reported at the IEEE 2001 MTT Symposium. The paper was titled A New Balanced Amplifier using Six-Port Power Divider. 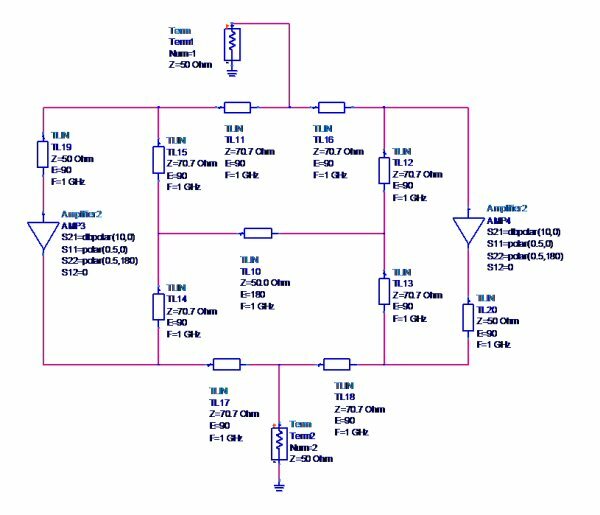 On first glance, this looks like the best thing since sliced bread: A network than can combine two amplifiers without the need for isolation resistors. Resistors are always needed in "conventional" combining approaches such as Lange couplers, branchlines or Wilkinsons. Resistors drive up the cost of a power combiner, and complicate its construction. The Lim-Eom network can be used as a three-way splitter, and the three split ports can provide arbitrary amplitudes by adjusting leg impedances. It also provides a two-way split function, and it actually can provide two two-way splitters from the six-port network. This is the property that was exploited in the paper referenced above. We rearranged the port numbers so that port one is at the middle of the top, and port 2 is at the middle of the bottom because these are going to be ports 1 and 2 of our power amp. Note that when used as an equal two-way splitter, there is a great deal more symmetry then when it is used as an equal three-way splitter. All of the lines around the perimeter have impedance SQRT(2)xZ0. The line though the center of the network can be any impedance and affects the bandwidth of some circuit parameters. 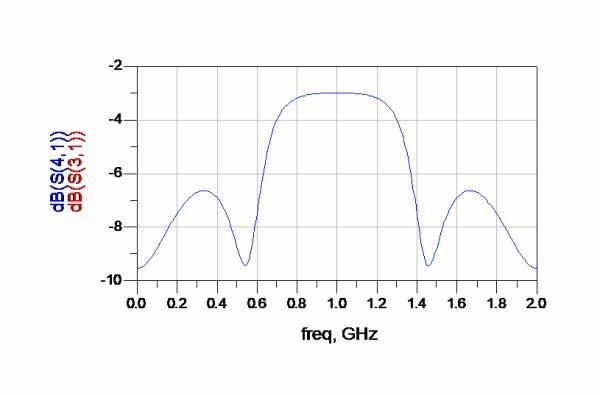 In the network below we left it at Z0 (fifty ohms). All of the ports are matched. If this was a three-port network, this would not be possible from basic network theory. No need to plot the split between port 2 two and ports 5 and 6, it is the same by symmetry. Going back to basic network theory, you can't make a three-port circuit that is lossless and impedance matched. The Lim Eom splitter provides two three-port functions which are both matched yet the circuit is ideally lossless. How did they pull off this magic trick? It's simple: the network is a six-port, not a three-port, even though it can be made to operate like two three-ports. 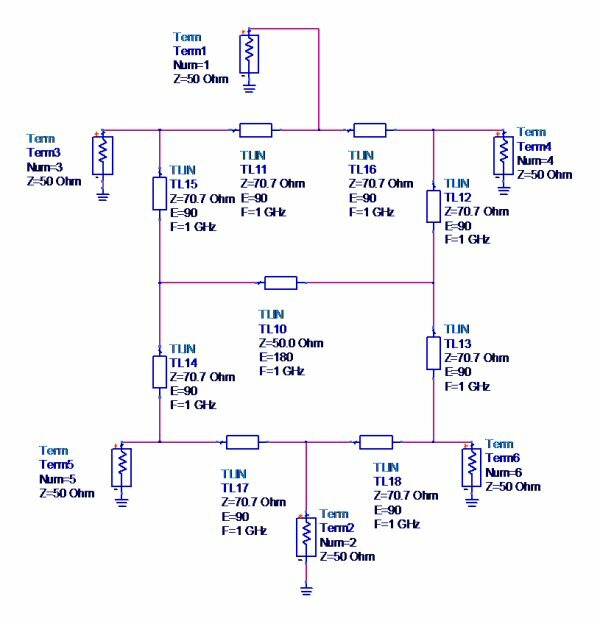 Now let's throw in some ideal amplifiers between ports 3 and 5, and between ports 4 and six (which is what Lim at al did). Now ports 1, 3 and 4 form the divider, and ports 2, 5 and 6 form the combiner. 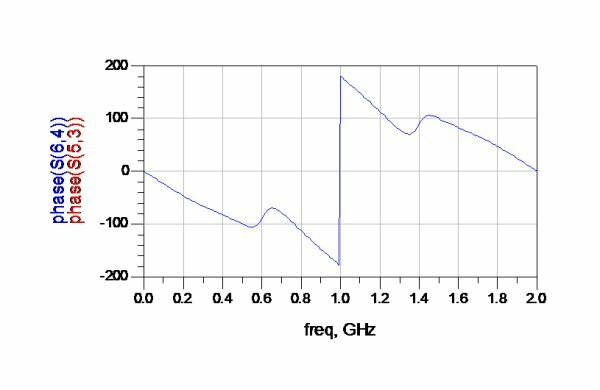 Here is the response with the ideal, perfectly matched, 10 dB gain amplifier. 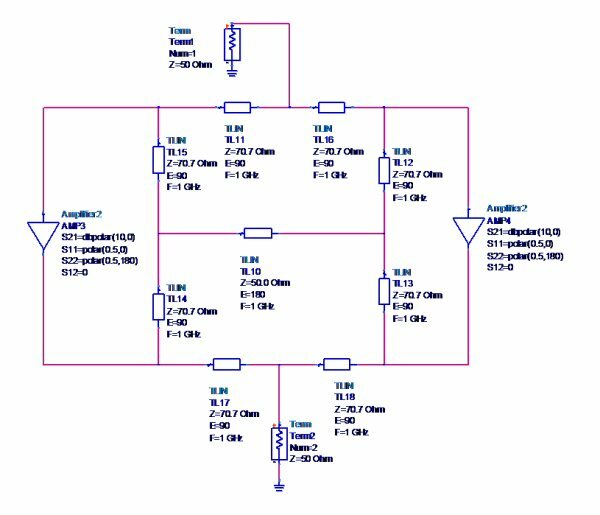 What would happen if the input and output ports of the amplifier were mismatched? The mismatch would mess show up at the input and output, just line when Wilkinson's are used to power combine. 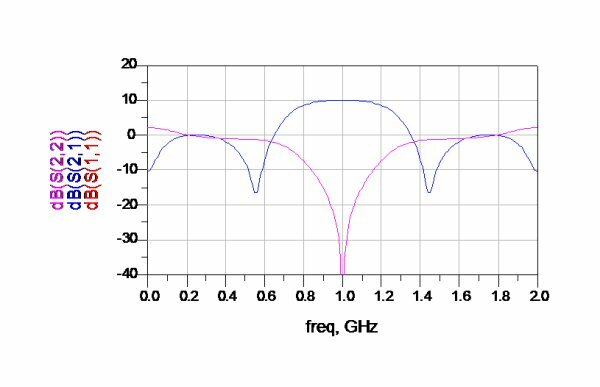 Here's a thought... why not add some quarterwave sections to the network so that the reflection coefficients cancel? This is sometimes done with Wilkinsons to improve amplifier match. Here's the response. Say, what's that, at 800 MHz the combined amplifier has more gain than the ideal amp we created it from? Isn't that perpetual motion? 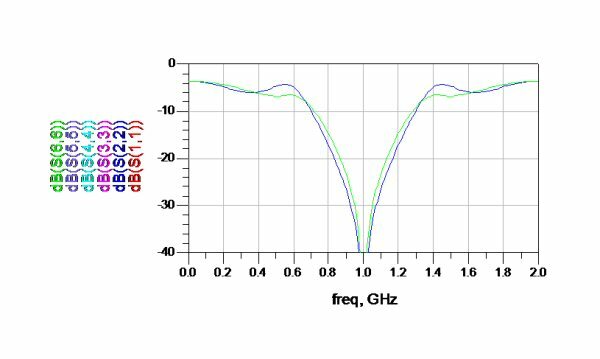 Because the feedback cannot be reduced to zero, the use of the Lim-Eom six-port splitter as a two-way combiner will probably be limited to narrrow-band applications, like the example the authors cited in their paper. We recommend that you only attempt this combiner on well-matched amplifiers that have DC blocks on both ports. One unfortunate side effect of all of this is that you will have to build bias networks into each of the amplifiers, in a balanced amplifier using Lange couplers for example you can bias the circuits right though the divider and combiner circuits. It is a cool idea, and it eliminates the need for resistors in a combining network, but just be aware of the potential for instability when you try it. By the way, the feedback issue was NOT described in the IEEE paper.